Want to improve all aspects of your life, relationships, and businesses? Would you like to discover YOUR natural secret weapon? Do you want tips and tricks to access and maximize using this secret weapon? Then you will want to turn in every week to hear how you can tap into this AMAZING resource…Your Brain. 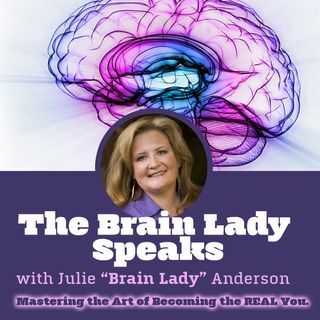 The Brain Lady Speaks show is about all things related to maximizing the power of your brain and understanding of the brain personality connection and the mind/brain/body connection can ... Más informaciones improve your businesses, relationships, health and life. The field of neuroscience is revealing amazing things about the brain. In the show we will explore the latest findings to see how they have practical application in our lives. When this knowledge is applied you will become a more effective and understanding parent; thrive in your personal and professional relationships; and see an increase in your business growth and profitability! Join us every week to have your MIND blown and your BRAIN expanded! Neuroscience and Success - Hush That Amygdala! How To Survive the End of 2018 So No One Gets Hurt!